Over the past few months I have attempted to imagine the world of digital diplomacy as social networks. This has enabled me to explore the potential use of digital diplomacy as a source for gathering and disseminating information amongst various diplomatic institutions such as ministries of foreign affairs and embassies. My research has often focused on how world embassies to the UN use their digital diplomacy channels. The UN represents a fascinating case study as it is the world’s most important diplomatic hub. This week I attempted to explore the UN’s own digital diplomacy channels by focusing on the @UN twitter channel operated by the UN headquarters in New York. This was achieved by compiling a sample of 57 twitter channels- 56 twitter channels operated by world embassies to the UN and the @UN twitter channel itself. Using the Visone program I mapped the social network of the UN in New York as can be seen in the illustration below. Note that most dense area of the network includes the most popular embassies in this network as well as those embassies that are the most avid followers of their peers at the United Nations. The image below locates the @UN twitter channel in this social network. As can be seen, the UN’s twitter channel is located in the densely populated gray area indicating that it is followed by numerous other embassies and that it actively follows world embassies to the UN. However, characterizing the location of UN’s twitter channel in this social network also required the calculation of three important parameters: in-degree, out-degree and betweenness. The in-degree parameter, seen below, measures each embassy’s popularity in the network. The higher an embassy’s popularity the greater its ability to disseminate information throughout this network. The twitter channel with the highest in-degree parameter was the @UN twitter channel as this channel is followed by 50 of the 56 embassies to the UN comprising my sample. The embassy with the second highest in-degree score is the US which is followed by 44 other embassies. Germany comes in the third place followed by the UK at fourth place, France, EU, Sweden, Rwanda, Norway and New Zealand. The out-degree parameter (seen below), which indicates the amount of other embassies with whom one embassy has contact, is also of paramount importance. The higher an embassy’s out-degree score the greater its ability to gather information from other members of this social network. For instance, an embassy that actively follows its peers is able to anticipate other countries’ initiatives in various UN organizations. The twitter channel with the highest out-degree parameter is also the @UN twitter channel as it follows 53 of the 56 embassies comprising my sample. The embassy with second highest out-degree score is Spain followed by New Zealand, Cyprus, Palestine, the US, Netherlands, Poland, the E.U. and Switzerland. 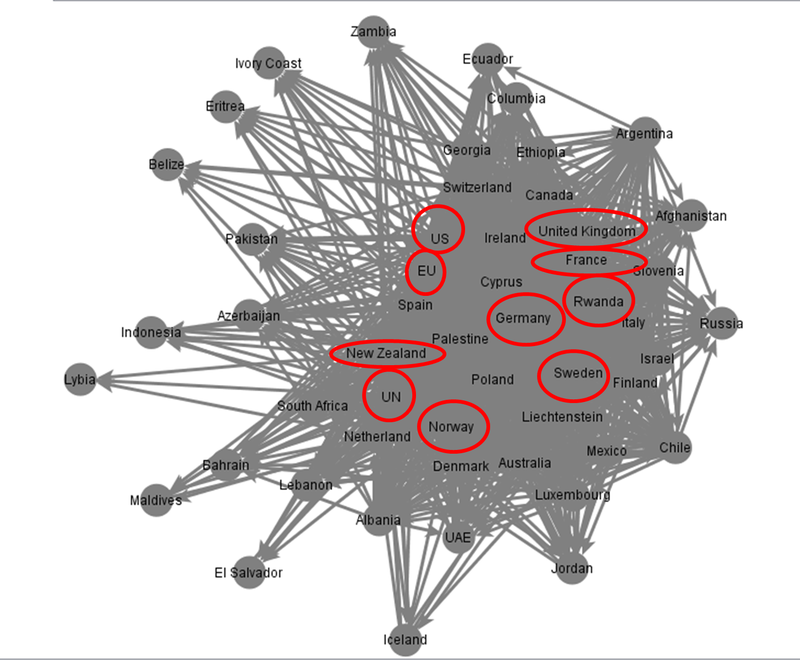 The final parameter calculated was the betweenness parameter (seen below) which reveals which embassies serve as important hubs of information as they link together embassies that do not follow each other directly. Here again the @UN twitter channel had the highest score indicating that the UN truly is a diplomatic hub linking together nations from all over the world. While the US had the second highest betweenness score there was a major gap between the two twitter channels as the @UN channel scored a whopping 22.625 as opposed to the US’s embassy to the UN that scored 9.301. New Zealand’s embassy to the UN had the third highest score followed by the Netherlands, the E.U., Germany, Spain, the U.K., Cyprus and Palestine. In summary, it seems that the UN in New York is in a unique position to realize the full potential of digital diplomacy given its popularity amongst world embassies to the UN, its contact with other embassies and its position as an important information hub for countries that do not directly follow one another. It should also be noted that in addition to the @UN twitter channel, the US, New Zealand and the E.U. were the only other members of this social network to receive high scores on all three parameters evaluated. Posted in Uncategorized and tagged Digital Diplomacy, twiplomacy, Twitter, UN, united nations. Bookmark the permalink.